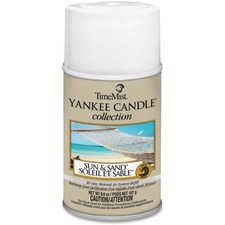 TimeMist Yankee Candle collection offers premium fragrances for full-size TimeMist metered air fresheners. Air freshener refill lasts a full 30 days and covers 6,000 cubic feet for 30 days, 24 hours a day when set at 15-minute intervals. 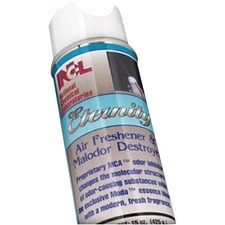 Aero Air Freshener Refill - Aerosol - 6000 ft? 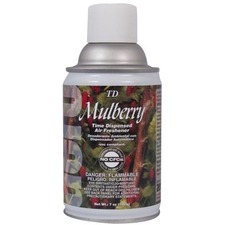 - 7 fl oz (0.2 quart) - Mulberry - 30 Day - 1 Each - Non-staining, Long Lasting, CFC-free, Odor Neutralizer AERO® brand aerosols are the finest available anywhere. A full range of solutions, from cleaning, to pest control. No other products can match our standards or our commitment to quality. 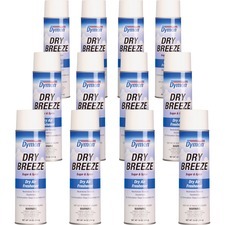 Versatile dry aerosol eliminates odors in the air without messy fallout. It is highly effective in combating tobacco and other odors. Special valve on Dry Breeze Dry Air Freshener allows spraying when can is held upside down. Freshmatic Ultra automatic spray refill neutralizes odors and provides continuous freshness for up to 60 days. Its waterless formula diffuses more fragrance in the air and less on the floor to keep rooms smelling great for longer. Automatic spray refill is designed for use in Air Wick Freshmatic Ultra automatic sprayers (sold separately). Air freshener is perfect for use in hotels, healthcare facilities, nursing homes, office buildings, restrooms and more. 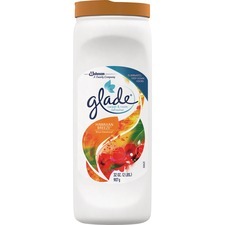 Glade Carpet & Room Refresher - 32 fl oz (1 quart) - Hawaiian Breeze - 1 Each - Odor Neutralizer Glade Carpet Odor Eliminator quickly removes deep-down odors at the source and replaces them with a warm, inviting fragrance. Hawaiian Breeze scent delivers the fresh scent of tropical fruits, pineapple and plumeria to enhance rooms with the cooling winds of paradise. Its advanced, easy-to-use formula requires just a sprinkle to ensure your carpets are infused with a fresh, enjoyable fragrance for time-saving cleanings. Carpet odor eliminator is perfect for removing odors caused by smoke, pets, mold, mildew and more. 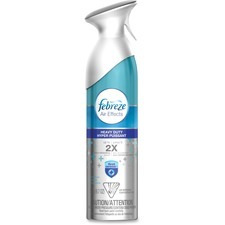 Use Febreze Air Effects Heavy-duty Crisp Clean as your first defense against bad odors. It is equipped with twice the odor-eliminating as standard sprays. Just a simple spray sweeps away odors, from everyday staleness to pet, bathroom and food odors - even stubborn smoke. The invigorating blend of lemony verbena, crisp cucumber, and cool, watery notes eliminates odors. Air freshener & malodor destroyer for controlling obnoxious odors. Utilizes proprietary MCA™ odor inhibitors to change the molecular structure of odor causing substances. 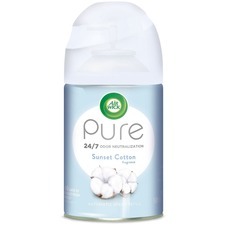 Fills the area with a modern fresh scent and controls odors for over 24 hours. Scented beads eliminate the toughest odors like smoke, pet, kitchen and bathroom odors. 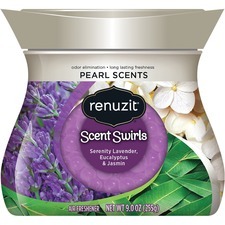 With this pretty little jar of Renuzit Pearl Scents, there's no need for electric plugs, flames or spraying. Simply set it down. The super-odor neutralizing beads continuously eliminate odors, instead of masking them, and leave a light, fresh scent for up to 30 days. Part of the Aromatherapy Collection, the Renuzit Pearl Scents Serenity transforms your room into a relaxing space with the calming scent of lavender and soothing botanical florals. 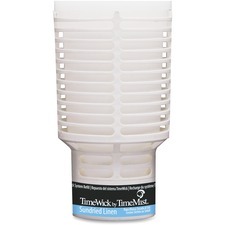 Air freshener refill is designed for use in the TimeWick air freshener system. Sun-dried Linen refill contains essential oils with the scent of fresh cleaned linens drying on a warm day. The fragrance also contains high-powered odor-counteractants. Refill lasts 60 days.